"It’s a wonderful product, I love using my Powerball". "Its excellent, I am using my Powerball everyday and it has helped me loads in my exercises". "Powerball is fitness with fun". "Powerball is very helpful for my daily exercises and has had improving effects on my biceps". "I love my Powerball. I have been using it everyday and it has helped me a lot". "Powerball is one workout you can’t miss". "I like my Powerball. I have been using it daily and also recommend my students to use Powerball for their daily exercises". "I am very happy to have found a product like powerball, because it is a brilliant and a portable tool for keeping my arms fit and strong. The simple working of the powerball saves me the time I would spend at a gym, going through a boring, arms work-out routine, and allows me to do it anytime, anywhere". "I found Powerball amazing and have even gifted one to a friend who complained about shoulder pain. After regular use of Powerball, I feel my arms are stronger and my friend says the pain on his shoulder is gone". "Thanks for the Powerball. It’s amazing the way it builds up power in your hands and one has to really strain one's muscles to hold it right as it picks up momentum. I have personally gained by regular use in as much as I can feel my biceps and triceps getting firm and stronger within just few minutes of use everyday. It’s amazing!!". 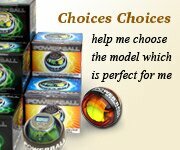 "Powerball is very good it has helped me and my family alot in our daily exercise routine and is very useful. I found it a bit expensive in the begining but now i feel Its totaly worth my money". "Once You Rip You Just Can't Quit! This is probably the most addictive toy I have ever laid my hands on. The minute you feel the ball move you just can't help being fascinated by the power of its spin! It’s also the best workout I have ever had for my arms. Cheers to the Navitas Team for another awesome product "!!! "Powerball is great. It really works! I am using it daily and am very happy with the way it helps my fitness routine". "Powerball is dynamic and “completely revolutionary". “I am a 62 years old industrialist living in Calcutta who met with a serious accident with a military truck and was saved by a miracle. Few days after the accident, I observed my right hand getting weaker day by day. I couldn’t open the door of my car nor could I lift a 1 liter bottle of water. My doctors were worried due to loss of muscles in my arm. Then, a miracle happened; my son found out about The Powerball on the internet and ordered 2 pieces for us. I have been using my Powerball everyday since the beginning of August 2006, morning and evening for 20 minutes religiously and it has done wonders for me. Firstly, my right hand has not only become normal, but has also developed muscles and strength in just 6 weeks. Secondly, I have been suffering constantly from Spondilysis since almost 15 years and my neck had become extremely stiff, since I have started using my Powerball my neck movement has become normal and the pain from my ailment has almost vanished. Thirdly, I had a lot of loose flesh on my shoulders and upper arm which have now tightened to a point where my friends compliment me. Lastly, My arms were so week that I had problems lifting my luggage while traveling but now, I have developed enough strength in my arms that I am able to carry 30kg of luggage without any effort. I am totally addicted to my Powerball and can say that it can do wonders. --- Dr. Dhara Chirag, Bangalore "Let me congratulate you to make Powerball available in India. I am a recreational badminton player and find my Powerball really useful in increasing my lower and upper arm strength". "I bought a Powerball for my mother who had developed pain on her shoulder from a fall some time ago. After using Powerball for just three weeks regularly, her pain has disappeared and she feels a lot better now". Let us know what you think of the NSD Powerball and indeed of our company. We are always interested to receive feedback from you regarding the NSD Powerball and how it has worked for you in your particular environment. If you have suffered in the past from Carpal Tunnel, RSI, Tennis Elbow or indeed have found that the NSD Powerball has been of use in training for your chosen sport or as an aid in rehabilitation, please let us know.